I love hosting guests for any and every reason throughout the year but it seems during the holidays the number of people we entertain doubles. Sometimes you're expecting them but sometimes you're not. 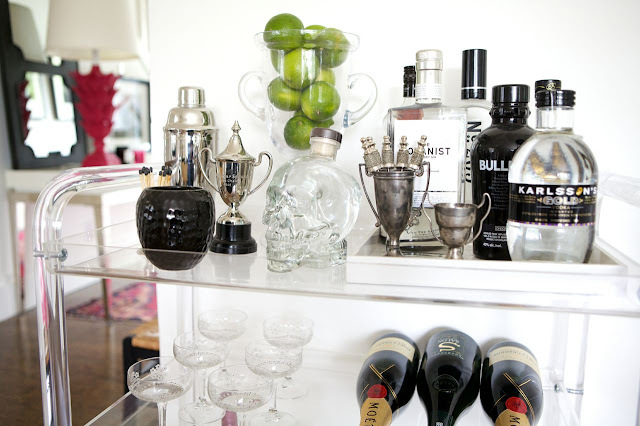 In the event that I have surprise visitors drop by I've always kept a properly stocked bar cart so that I'm prepared. 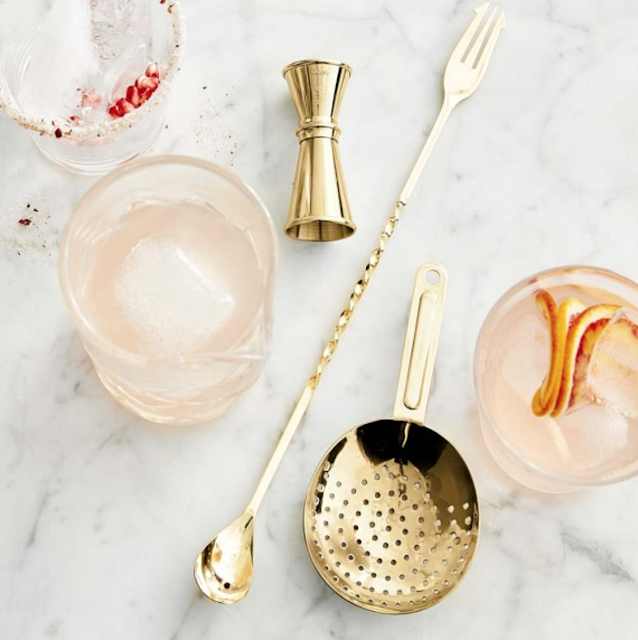 There's something so dignified about being able to offer a well mixed cocktail in front of guests at a beautifully curated drink station. The ceremonious mixing and presentation of a signature beverage creates such an experience for your guest as well. 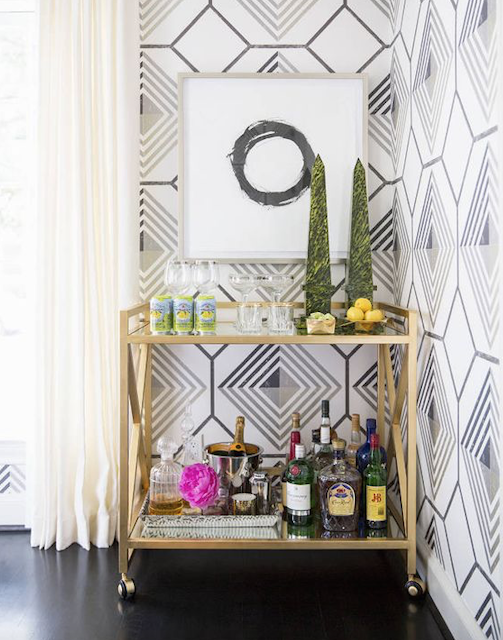 A bar cart or cabinet. Staple liquors based on drinks you'll make. A good start is bourbon (or whiskey), gin, rum, tequila, vodka, vermouth. Wine. Depending on preference. It's nice to have champagne on hand for special occasions. Mix. Soda, tonic, bitters, sugar cubes, simple syrup. Small trays to organize and divide items based on purpose or use. Quintessential cocktail recipe book like these here and here. Extras. cocktail napkins, straws, coasters. Splurge on bottles with pretty packaging. Work decor elements, like fresh flowers or a candle and additional matches into the display. Don't be tempted to go bananas buying obscure liquors. Stick to the basics you'll actually use. Freeze raspberries in cranberry juice to serve brunch guests a more thoughtful mimosa. Be creative but stick to themes that will honour the rest of the room the cart resides in. 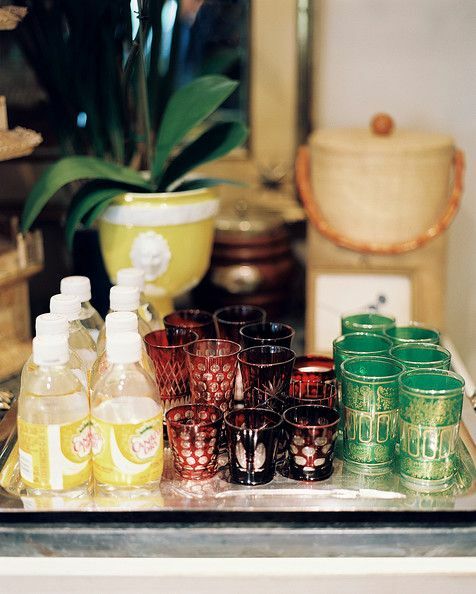 Keep a lucite tray or two on the top shelf of your cart as your main prep surface and to keep bottles in. It will be easier to take away and pop in the dishwasher to clean up sticky rings and drips. A sticky bottle in my own home actually removed the lacquer surface of my side board and left a ring exposing the bar wood below. If there's a particular drink that's your favourite stock items for it first and indulge in the right tools to make it. For example if you love dirty martinis invest in some pretty olive picks, martini glasses and appropriate ingredients. Of note, one of my sweet LDS friends made an amazing refreshment cart. 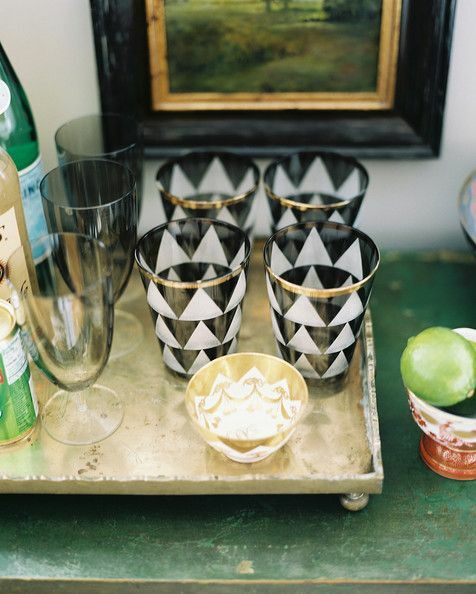 She keeps it stocked with sparkling apple cider, san pellegrino fruit seltzers and whatever else suits the occasion.